In my last post, I wrote about making a cluttered data set easier to work with by removing unneeded columns entirely, and by displaying just those columns you want to work with now. But too much unneeded data isn't always the problem. What can you do when someone gives you data that isn't organized the way you need it to be? That happens for a variety of reasons, but most often it's because the simplest way for people to collect data is with a format that might make it difficult to assess in a worksheet. Most statistical software will accept a wide range of data layouts, but just because a layout is readable doesn't mean it will be easy to analyze. You may not be in control of how your data were collected, but you can use tools like sorting, stacking, and ordering to put your data into a format that makes sense and is easy for you to use. Depending on how its arranged, the same data can be easier to work with, simpler to understand, and can even yield deeper and more sophisticated insights. I can't tell you the best way to organize your specific data set, because that will depend on the types of analysis you want to perform, and the nature of the data you're working with. 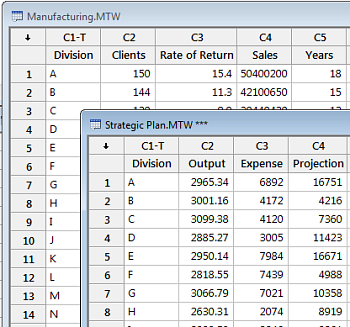 However, I can show you some easy ways to rearrange your data into the form that you select. 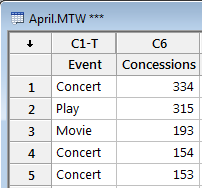 The data below show concession sales for different types of events held at a local theater. 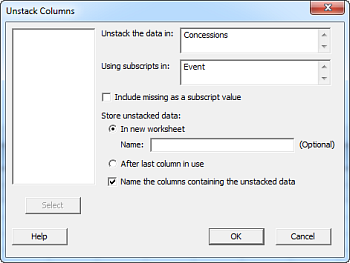 Select Data > Stack > Columns... and select the columns you wish to combine. 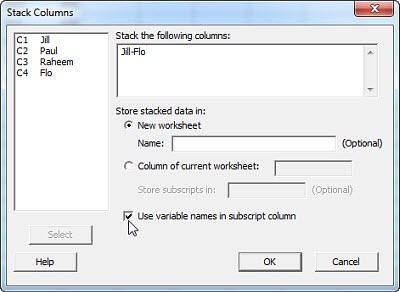 Checking the "Use variable names in subscript column" will create a second column that identifies the person who made each sale. 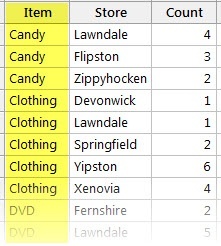 The following data appear in the worksheet in the order in which individual stores in a chain sent them into the central accounting system. 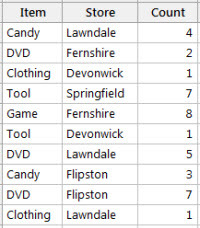 When the data appear in this uncontrolled order, finding an observation for any particular item, or from any specific store, would entail reviewing the entire list. 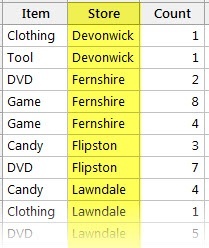 We can fix that problem by selecting Data > Sort... and reordering the data by either store or item. What if you need to analyze information about the same items, but that were recorded on separate worksheets? For instance, if one group was gathering historic data about all of a corporation's manufacturing operations, while another was working on strategic planning, and your analysis required data from each? 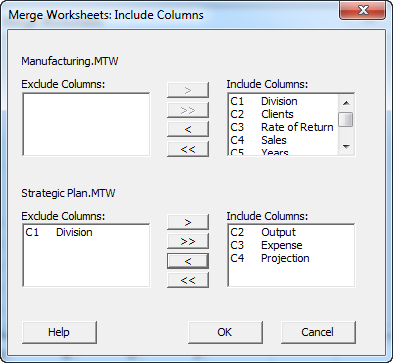 You can also choose whether or not multiple, missing, or unmatched observations will be included in the merged worksheet. Making changes to the layout of your worksheet does entail a small investment of time, but it can bring big returns in making analyses quicker and easier to perform. The next time you're confronted with raw data that isn't ready to play nice, try some of these approaches to get it under control. In my next post, I'll share some tips and tricks that can help you get more information out of your data.